Iranian political prisoner Arash Sadeghi is facing grave health concerns with over forty days on hunger strike in Evin Prison in protest to the arrest of his spouse, Golrokh Ebrahimi Iraee. Activists and human rights group that are following his situation and report that Sadeghi was transferred to the hospital after vomiting blood but returned after he refused an IV. Sheragim Zand, a Turkey based journalist reported in his Facebook that those who are in contact with Sadeghi and have seen images of him after his long hunger strike do not have much hope of his survival. 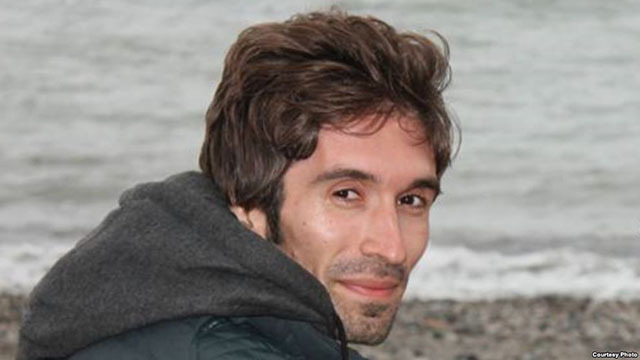 Meanwhile a group of activists have initiated a petition calling for immediate attention to Arash Sadeghi’s situation. A number of Iranian political prisoners have also issued a statement announcing their solidarity with Sadeghi. While Behnam Mousivand from Rejaishahr has written a message of support for Sadeghi, protests in Evin Prison’s women’s ward finally resulted in an opportunity for Golrokh Iraee to visit her husband. Human Rights Activists News Agency (HRANA) reports that prisoners in the women’s ward staged a protests last Sunday when prison authorities persisted in preventing a visit between the couple and finally at 7 pm, the two were allowed to meet briefly. Arash Sadeghi is sentenced to 15 years in jail for charges related to national security. The couple have appealed their respective sentences. Latest reports indicate that in the past week Sadeghi is having trouble articulating and has suffered a weight loss of fifteen kilograms. Amnesty International also issued a statement last week highlighting Arash Sadeghi’s plight and demanding the immediate release of the couple.